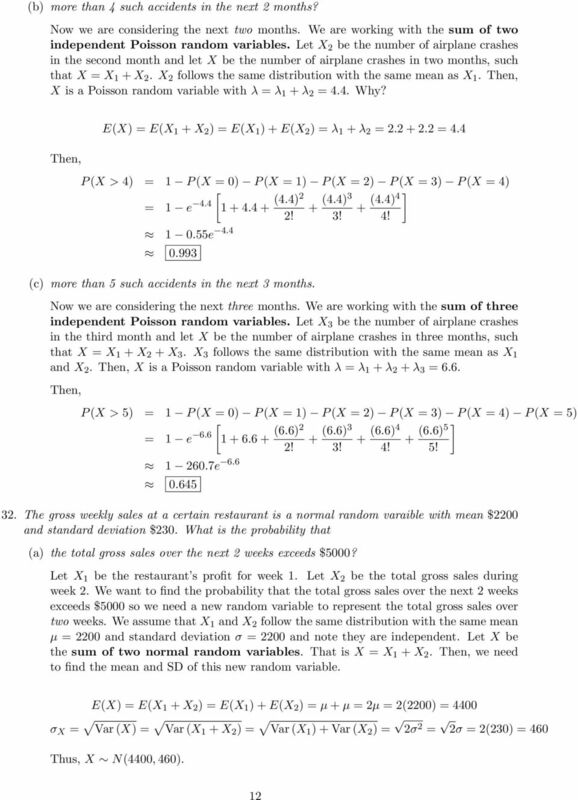 Download "Statistics 100A Homework 7 Solutions"
1 Chapter 6 Statistics A Homework 7 Solutions Ryan Rosario. A television store owner figures that 45 percent of the customers entering his store will purchase an ordinary television set, 5 percent will purchase a color television set, and 4 percent will just be browsing. If 5 customers enter his store on a given day, what is the probability that he will sell exactly ordinary sets and color set on that day? 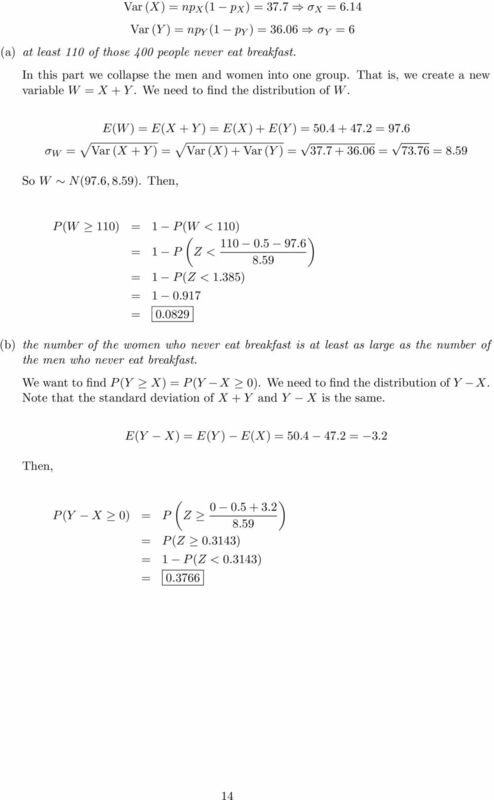 In this problem, we take a look at a distribution that we have not studied in this course, the multinomial distribution. 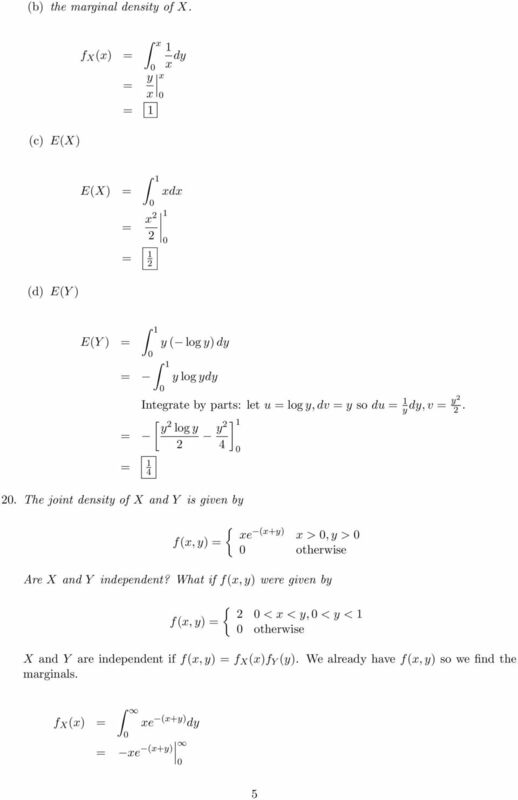 The PDF for the multinomial distribution is below P (X x,..., X r x r ) n! n!n!... n r! pn pn... pn P n i r The probability that exactly ordinary sets (X ) and plasma set (X ) are purchased (and the rest X 3 are just browsing) is given by P (X, X, X 3 ) 5!!!! (.45) (.5)(.4) A man and a woman agree to meet at a certain location about :3 p.m. If the man arrives at a time uniformly distributed between :5 and :45 and the woman independently arrives at a time uniformly distributed between :3 and pm, find the probability that the man arrives first? The easiest way to illustrate this problem is to consider a geometric representation. Let X be the number of minutes past noon that the man arrives, and let Y represent the number of minutes past noon that the woman arrives. From the problem, we know that 5 X 45 and Y 6. First we find the probability that the first to arrive waits no longer than 5 minutes for the other person. There are two ways to do this: either the man can arrive first and waits for the woman, or vice-verse. First consider the situation that the man arrives first. The man arrives sometime between 5 minutes and 45 minutes past noon. The acceptable time for the woman to arrive is no later than 5 minutes after the man. We can represent this situation geometrically. Given that the man arrives between 5 and 45 minutes after noon, the woman independently arrives some time within the hour. This area is shaded in light grey and has area 8. So that the man does not get impatient, the woman must arrive before 5 minutes have passed. The minutes for the man and woman to arrive such that the man does not become impatient is shaded in black and has area 5 (a parallelogram). 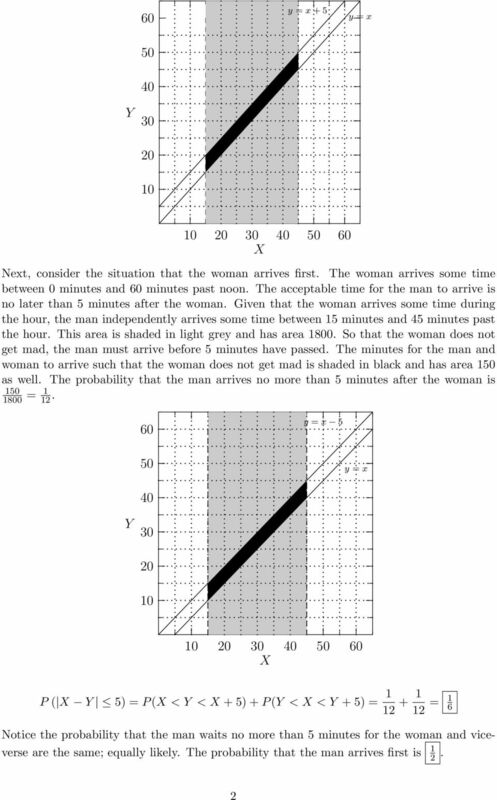 The probability that the woman arrives no more than 5 minutes after the man is 5 8. 2 6 5 4 y x + 5 y x Y X Next, consider the situation that the woman arrives first. The woman arrives some time between minutes and 6 minutes past noon. The acceptable time for the man to arrive is no later than 5 minutes after the woman. Given that the woman arrives some time during the hour, the man independently arrives some time between 5 minutes and 45 minutes past the hour. This area is shaded in light grey and has area 8. So that the woman does not get mad, the man must arrive before 5 minutes have passed. The minutes for the man and woman to arrive such that the woman does not get mad is shaded in black and has area 5 as well. 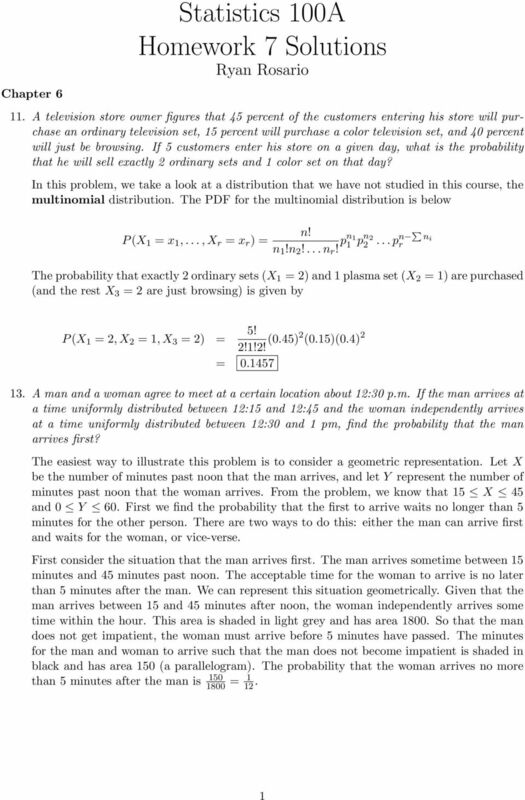 The probability that the man arrives no more than 5 minutes after the woman is y x 5 5 y x 4 Y X P ( X Y 5) P (X < Y < X + 5) + P (Y < X < Y + 5) + 6 Notice the probability that the man waits no more than 5 minutes for the woman and viceverse are the same; equally likely. The probability that the man arrives first is. 12 (b) more than 4 such accidents in the next months? Now we are considering the next two months. 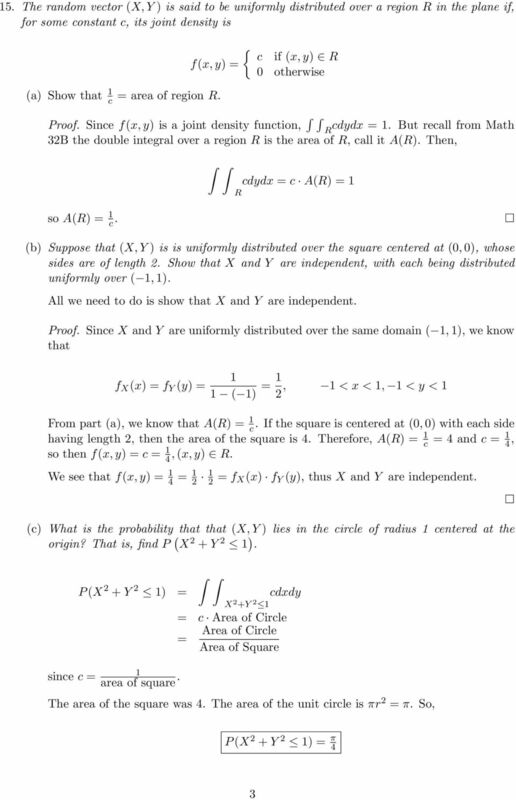 We are working with the sum of two independent Poisson random variables. 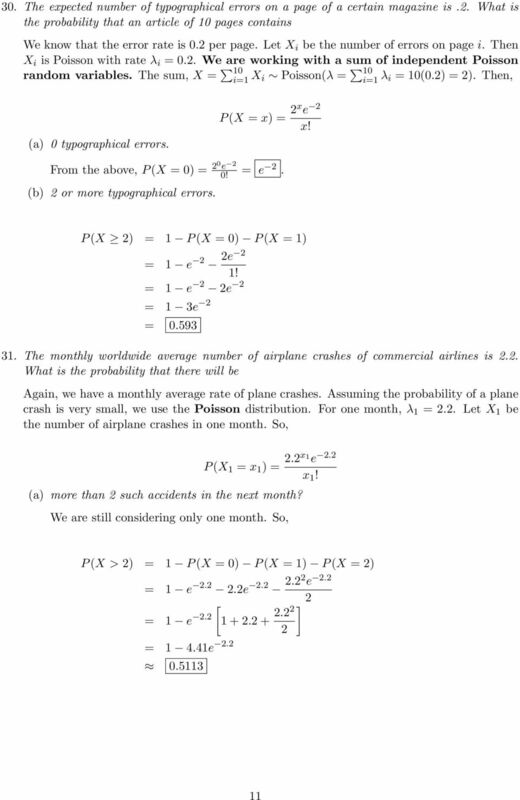 Let X be the number of airplane crashes in the second month and let X be the number of airplane crashes in two months, such that X X + X. X follows the same distribution with the same mean as X. 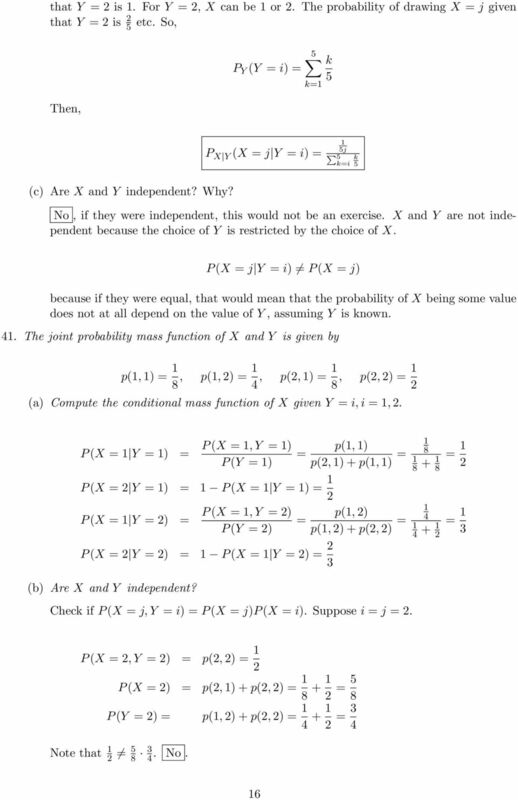 Then, X is a Poisson random variable with λ λ + λ 4.4. Why? Then, E(X) E(X + X ) E(X ) + E(X ) λ + λ P (X > 4) P (X ) P (X ) P (X ) P (X 3) P (X 4) [ ] e (4.4) + (4.4)3 + (4.4)4! 3! 4!.55e (c) more than 5 such accidents in the next 3 months. Now we are considering the next three months. 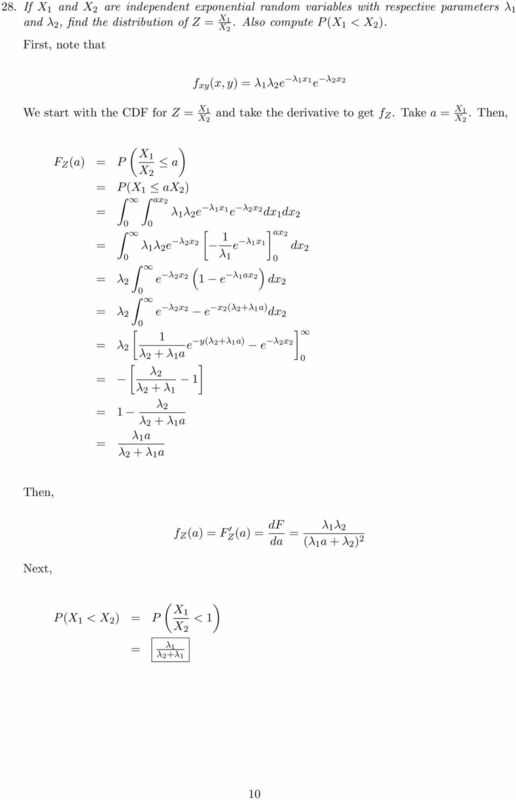 We are working with the sum of three independent Poisson random variables. Let X 3 be the number of airplane crashes in the third month and let X be the number of airplane crashes in three months, such that X X + X + X 3. X 3 follows the same distribution with the same mean as X and X. Then, X is a Poisson random variable with λ λ + λ + λ Then, P (X > 5) P (X ) P (X ) P (X ) P (X 3) P (X 4) P (X 5) [ ] e (6.6) + (6.6)3 + (6.6)4 + (6.6)5! 3! 4! 5! 6.7e The gross weekly sales at a certain restaurant is a normal random varaible with mean $ and standard deviation $3. What is the probability that (a) the total gross sales over the next weeks exceeds $5? Let X be the restaurant s profit for week. Let X be the total gross sales during week. We want to find the probability that the total gross sales over the next weeks exceeds $5 so we need a new random variable to represent the total gross sales over two weeks. 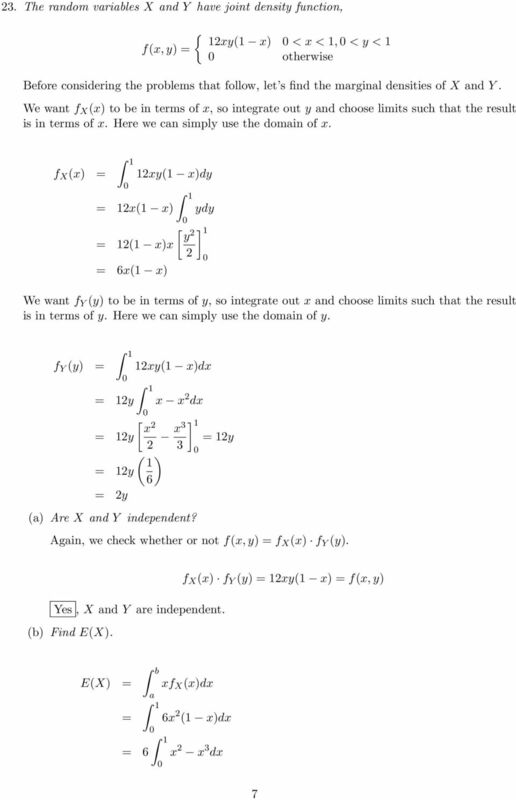 We assume that X and X follow the same distribution with the same mean µ and standard deviation σ and note they are independent. Let X be the sum of two normal random variables. That is X X + X. 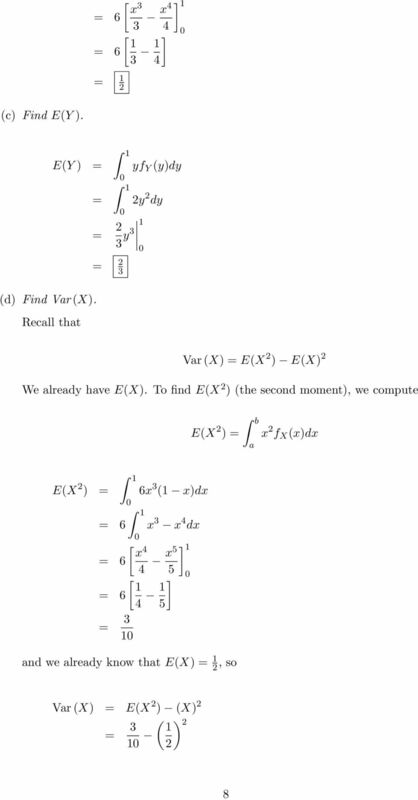 Then, we need to find the mean and SD of this new random variable. E(X) E(X + X ) E(X ) + E(X ) µ + µ µ () 44 σ X Var (X) Var (X + X ) Var (X ) + Var (X ) σ σ (3) 46 Thus, X N(44, 46). e.g. arrival of a customer to a service station or breakdown of a component in some system. 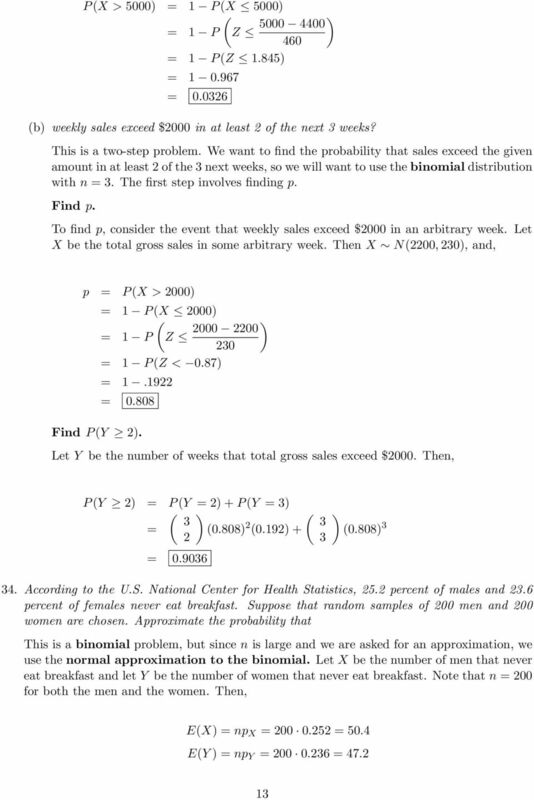 Chapter 4 Statistics 00A Homework 4 Solutions Ryan Rosario 39. A ball is drawn from an urn containing 3 white and 3 black balls. After the ball is drawn, it is then replaced and another ball is drawn. Name: Math 29 Probability. Practice Second Midterm Exam 1. 1. Show all work. 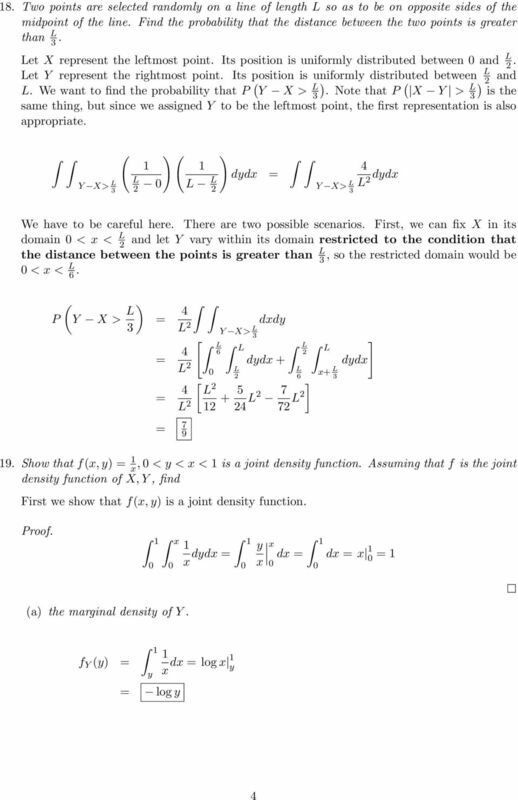 You may receive partial credit for partially completed problems. 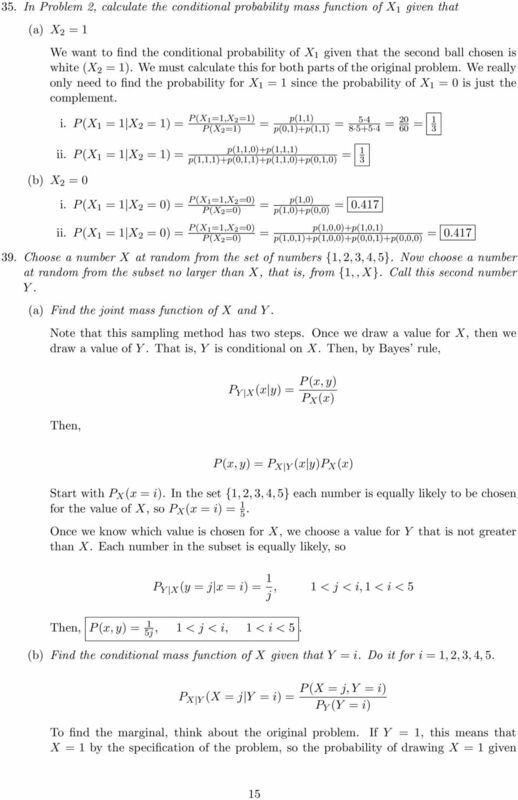 Solutions for Review Problems for Exam 2 Math 1040 1 1. You roll two fair dice. (a) Draw a tree diagram for this experiment.